As we ask anew in these troubled times what it means to be an American, You, the People provides perspective by casting its eye over the answers given by past U.S. presidents in their addresses to the public. Who is an American, and who is not? Since the founders first identified the nation as “we, the people,” the faces and accents of U.S. citizens have changed dramatically. Yet on various occasions U.S. presidents have had to speak as though there were one monolithic American people. 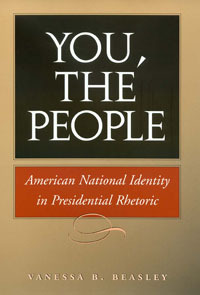 Here Beasley traces rhetorical constructions of American national identity in presidents’ inaugural addresses and state-of-the-union messages from 1885 through 2000. She argues convincingly that while the demographics of the voting citizenry changed rapidly during this period, presidential definitions of American national identity did not. Chief executives have consistently employed a rhetoric of American nationalism that is simultaneously inclusive and exclusive; Beasley examines both the genius and the limitations of this language. For all those who are puzzling over the nature of citizenship and whether there are new limits in post-9/11 America, Beasley offers an explanation of how political community can endure in an increasingly multicultural era. VANESSA B. BEASLEY is an assistant professor at Southern Methodist University in Dallas, Texas.